In celebration of premium lawn brand Mahnoush’s five definitive years in lawn and fashion, entrepreneur and head designer at Mahnoush, Arjumand Amin, introduces The Anniversary Edition campaign, inspired by five modern, diverse and dynamic women in Pakistan, each of whom are symbolic of what Mahnoush represents over the course of its journey: quality, distinctiveness and beauty. The campaign will be revealed at the launch of Mahnoush Lawn this March and the collection itself will across Pakistan as of 25th March 2014 at select retailers1. 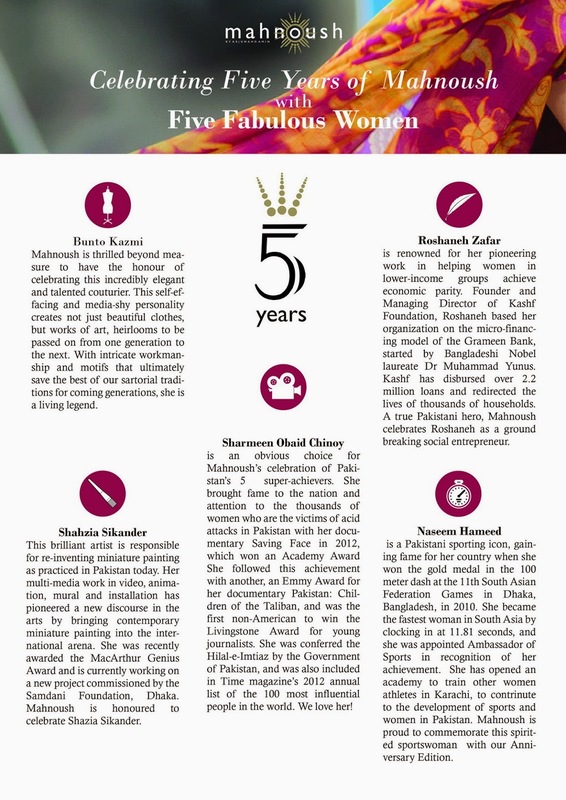 The 5 incredible women being celebrated by Mahnoush are master couturier Bunto Kazmi, the fearless filmmaker Sharmeen Obaid Chinoy, artist extraordinaire Shahzia Sikander, dynamic social entrepreneur Roshaneh Zafar and leading athlete and sporting entrepreneur Naseem Hameed. Each of these 5 formidable women has been photographed by Abdullah Harris for a celebration campaign to be revealed in print and across social media in March itself. Speaking about Mahnoush’s 5 years celebration with 5 incredible women, CEO and Head Designer of Mahnoush, Arjumand Amin has said: “With our 5 year anniversary edition, I am honoured to be celebrating 5 unique women, each of whom has worked to change the landscape in which they operate. Mahnoush is thrilled beyond measure to have the honour of celebrating Bunto Kazmi, the incredibly elegant and talented couturier. This self-effacing and media-shy personality creates not just beautiful clothes, but works of art, heirlooms to be passed on from one generation to the next. With intricate workmanship and motifs that ultimately save the best of our sartorial traditions for coming generations, she is a living legend. We are equally delighted to have Sharmeen Obaid Chinoy celebrated; she was an obvious choice for us. She brought fame to the nation and attention to the thousands of women who are the victims of acid attacks in Pakistan with her documentary Saving Face in 2012, which won an Academy Award. She followed this achievement with another, an Emmy Award for her documentary Pakistan: Children of the Taliban, and was the first non-American to win the Livingstone Award for young journalists. She was conferred the Hilal-e-Imtiaz by the Government of Pakistan, and was also included in Time magazine’s 2012 annual list of the 100 most influential people in the world. We love her! Mahnoush’s Anniversary Edition collection will be available across Pakistan as of 25th March 2014. 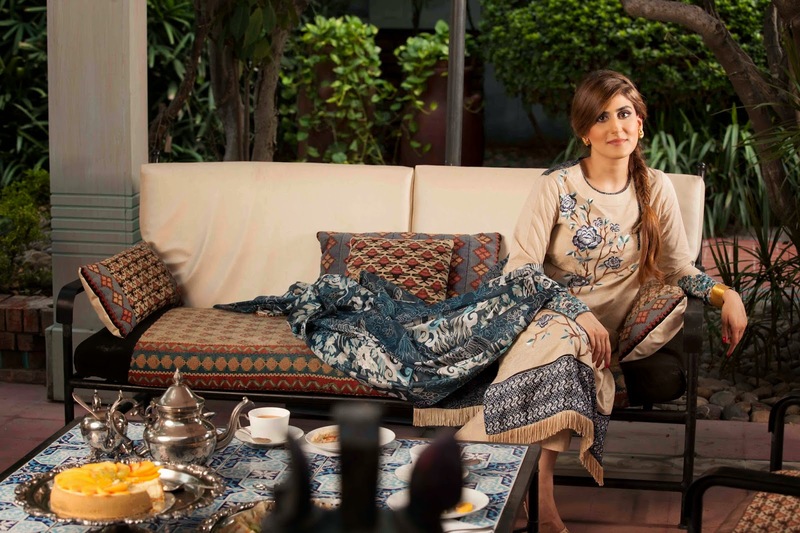 First launched in 2010 by entrepreneur and design force Arjumand Amin, Mahnoush is a niche brand, which has fast gained renown for exceptional fabric quality and inspired design sensibility, as evident from its nomination for a coveted Lux Style Award in 20132. Quality is manifest most notably in the construction of the fabric, with the brand exclusively using 100 percent Pima cotton, widely acknowledged as one of the finest cottons in the world. As always, Mahnoush’s seasonal designs are the result of the creators’ deeply researched approach with inspirations derived from Arjumand’s academic and aesthetic study of numerous books and museum sources.